With the recall election a little over two weeks away, I am going to do something a little different today. While this story is not directly related to wildlife I thought that I would share another example of how “ethical” the Walker administration is and how arrogant this guy truly is. Not only is Wisconsin the only state in the country that allows the brutal practice of using packs of dogs against wolves, they are now the only state in the country to now use a new method for counting job creation. Again neither the federal government or any other state in the country uses this method, but Scott Walker has decided to magically turn Wisconsin’s worst in the nation job figures into a miracle of job growth. As we saw with the recently passed wolf kill bill this guy and his cronies will lie, cheat, and manipulate any number or fact to get their agenda passed. Now with his political future on the line Walker is making his dismal job numbers suddenly look completely different than reality. If Wisconsin voters choose to keep this guy in office then we deserve exactly what we get. What more do the citizens of this state need to show what kind of person this man and his administration are? John Doe? “Divide and Conquer?” “Drop the bomb?” Wetland destruction? Tax cuts for millionaires? DNR “pay to play?” Now this? 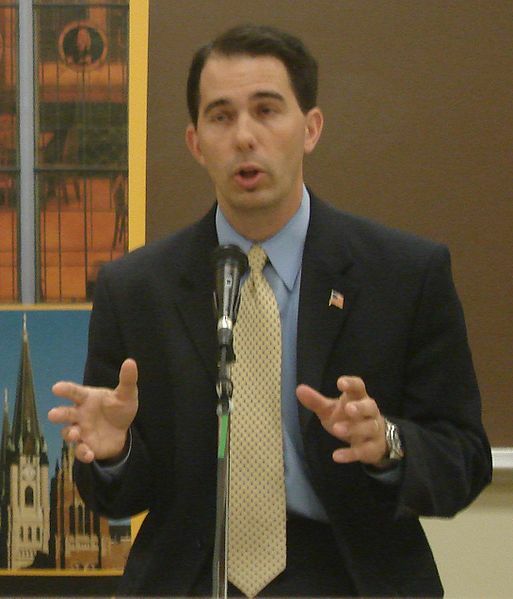 I see signs and bumper stickers and yard signs everywhere that say “We Stand With Scott Walker.” Why? Why do you stand with a man who brags about dividing our state? Why do you stand with a man who turns the very public employees who are our neighbors, family, and friends into evil scoundrels who are responsible for for the budget problems in the state. Wisconsin, it is gut-check time. Is the divisiveness and rancor that this guy has caused really worth it? Imagine how emboldened Walker and his goons will be if they survive the recall. Can Wisconsin really afford it? You decide. Wow- That Scott Walker is a job “creatin” fool. What’s his secret? All those jobs created in a matter of minutes. These guy is such a liar I hope Wisconsin voters are paying attention. I don’t know how much faith I have in Wisconsin voters anymore. The fact that this guy and right wing shills like Ron Johnson were elected in the first place gives me grave concern. This is not the same state that I grew up in. We went from being one of the most progressive states in the country to being a backwoods redneck hell overnight. The fact that people in this state would rather be governed by two faced, corrupt, theocrats like Walker and Kleefisch who spit in the face of our public servants tells me a lot about my fellow citizens. But at least we now have huntin’ and trappin’ being taught in schools and can kill wildlife on all of our public lands. And dogs are no longer our companions in this state, they are just another weapon that the “sportsmen” can use to torment wildlife. Our kids can’t read or write, but they can trap and torture with dogs wolves, bears and other wildlife. That sure prepares them well for the ’12 job market. Of course I am referring to the 1812 job market. Please vote Walker out and thank you Paul and Patricia for bringing these mistruths and lies to our attention. You are right. Wisconsin has become a backwoods redneck hell overnight literally as we slept. I hope Wisconsin voters are still not asleep on June 5th; otherwise we all will burn together in the hell Scott Walker & his cronies has masterminded. This country hasn’t suffered that much–yet. Europe had a world war,actually two. We haven’t been bombed, starved, killed off like flies and executed for who you are. But we are getting close.